For everything you need to know about chocolate, from its humble beginnings to its tasty end, with facts and info. inbetween, check out this website: www.chocolateexpert.co.uk. We moved a little while ago into the Forest of Dean for our online shop. We do have a sweet shop in Bodmin, Cornwall too so we can get some face to face feedback about our hand made chocolates and fudge. 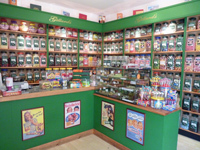 The picture shows our shop and its range of over 200 jars of sweets! . You can't say that we're not keeping up with the times - the Pilgrims website has been given a complete facelift, making it more user friendly, easier to navigate - and easier to place orders! Pilgrims Piano chocolates (shaped like a grand piano) were a great hit with the soloist and audience alike at a recent John Lill piano recital. You'll find these musical Chocolate Piano chocolates listed in the choices on our chocolates page. Chocoholics are being warned to be sceptical about claims that chocolate is good for the heart. Scientists sponsored by a confectionery maker say new research suggests that chocolate thins the blood and may help prevent blood clots. Eating chocolate as part of a balanced diet could help maintain a healthy heart and circulation, they propose. But the British Heart Foundation told BBC News Online that the claims were reckless and people would get more nutrients from eating fruit and vegetables. Natural compounds in cocoa called flavonoids are believed to be responsible for the reported positive benefits of chocolate. We have checked out the competition and can see that we are still cheaper than all the other companies we found with 'free' postage when you add the prices together! We have had to make the difficult decision to raise our charge for postage and packing. We have managed to absorb the last 3 years price rises without passing them on but unfortunately all of our costs have risen significantly this year again making the old charge unsustainable. The rise has been kept as small as possible and infact our charge is still cheaper than the cost to us. We apologise for this unwanted rise but hope you will understand our position and continue to support us. The Christmas season is approaching! Sorry to mention that :) We are gearing up to introduce new products and wholesale fudge, so watch this space. We have been very popular with schools and weddings this month so we are already busy!